The NFL doesn&apos;t seem to understand why a zero-tolerance approach to domestic violence matters. Unfortunately, they&apos;re not the only ones, as evidenced by what is most likely the most disgusting Halloween costume of the year. Sports fans and non-sports fans alike were shocked in early September after disturbing video emerged in which Baltimore Ravens running back Ray Rice was seen brutally knocking out and dragging his then-fiancee (now wife) Janay Palmer from an Atlantic City casino elevator months earlier. Rice received professional retribution in the form of a terminated contract but was accepted into a special program for first-time offenders. It spared him jail time and could lead to all charges being cleared for good behavior. The clear takeaway? Some men in power have little real accountability when it comes to creating environments where women are affirmed and respected. Unfortunately, that very logic — one rooted in misogyny and the devaluing of women and their bodies — emerged yet again at a Halloween party this past weekend when a man was photographed making fun of not just the elevator scene involving Rice but domestic violence in general. The photo, which emerged on Reddit this week, was posted by a user on the "Too Soon" channel and who confirmed — as if it needed confirmation — that the costume was indeed Rice. 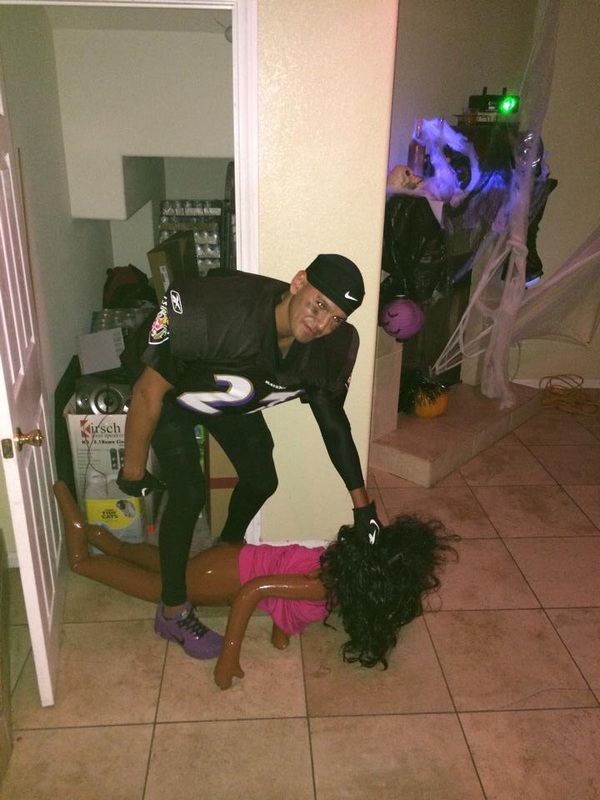 In another post, the same user, AL0311, shares yet another image of the guy dressed as Rice, dragging around a black blow-up doll to depict the unconscious Palmer. 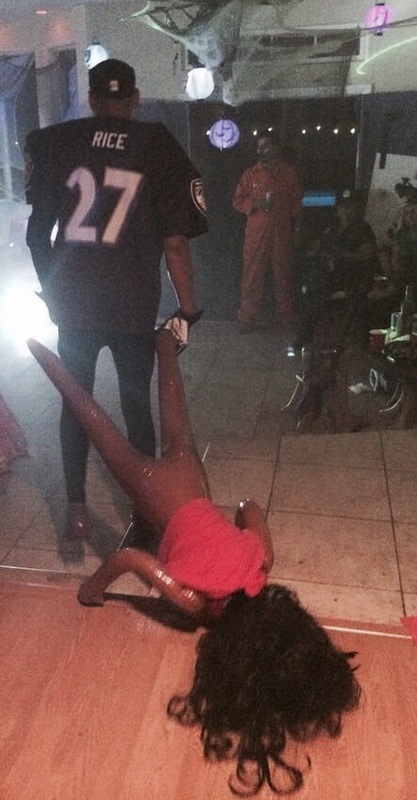 "Ladies were falling for my friends Ray Rice costume," the post said. Although it&apos;s unlikely the world will never know whether the women at the party really were in on the so-called joke, one thing is clear: Sexual and domestic violence is never a laughing matter. Men and women are impacted by the issue, yet numbers and studies consistently show that the abuse disproportionately affects women. According to the National Intimate Partner and Sexual Violence Survey, nearly half of all women experience sexual violence at some point in their lives — and these rates disproportionately impact both black and Native American women. This reality was thrown into sharp relief for those who watched the Rice controversy play out online and in the media. The complexities of the issue resonated poignantly with women, especially those who themselves had survived abuse, who spoke out against the type of victim-blaming eventually leveled against Palmer. Many of these brave women shared their personal stories in the hashtags #WhyIStayed and #WhyILeft on Twitter. It seems impossible that anyone would be able to read these stories without recognizing the way toxic masculinity and deeply ingrained misogyny leads people to routinely devalue women in nearly all facets of society — whether that is reflected in the deeply unfortunate choice of a Halloween costume or the actions of league officials worried about a public relations fallout. Because ensuring the game plays on, or that the party keeps rocking, still often comes at the expense of the survivors of intimate partner violence.